Rice Cooker Cleanup is Quick and Easy! You are here: Home / Home & Garden / Rice Cooker Cleanup is Quick and Easy! Having a lot of appliances and kitchen gadgets covering up valuable workspace in my kitchen has never been something I like. In fact, I have a rule that if I don’t use something at least twice a week; it gets allotted to a cupboard, shelf or drawer for those occasional uses. But my rice cooker has it’s own little sweet spot in the corner of my countertop because I use it so much…at least three times a week. And I have mastered the art of cleaning it quickly and efficiently! 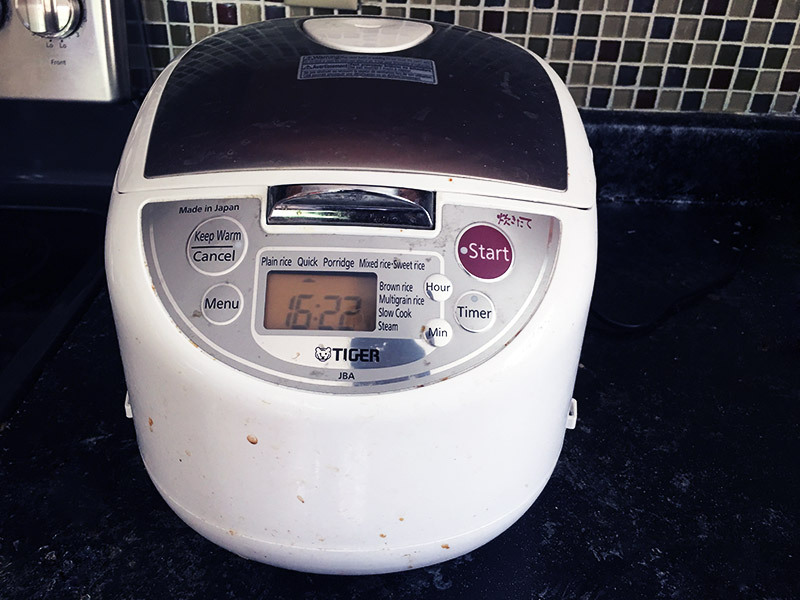 As with all electrical appliances, a rice cooker cannot be submerged in soapy water for a thorough scrub. Keeping water away for the power source is important. Be prompt. Soon after the cooker has cooled enough to handle, (which is usually after I have eaten) I give the interior of the cooker a thorough wiping out with a paper towel. It works well when the rice is still a little warm because the granules pulls away from the sides quite easily. Once it gets cold and baked on, these bits will cook again and be even harder to get off. Scraping this can cause damage to the machine. It’s important to make sure the cooker is cooled and this can really depend on the make and manufacturer, so consult the owner’s manual the first time. A hot or plugged in device could pose a serious safety hazard. A soapy bath. You can easily clean the lid, the main interior pot, and any other components that pop off. Most models have an inner lid that pops off easily, without too much force or the need of screwdriver. Wash as you would any other dishes – with warm soapy water and a good clear rinsing. Use a strong circular motion and if there are some stubborn stains use a soft sponge or scrubbing brush. Allow these parts to air dry as this will allow for any mildew buildup to dissipate and be fresh and clean for the next use. Keep it looking new. I never hesitate to clean the exterior of my appliances, even parts that don’t come into contact with the food. It’s more about keeping them looking new. If I am going to leave an appliance out on the counter, as I do with my rice cooker, my favorite polisher is vinegar and water. Keeping a solution of equal parts water to vinegar in a spray bottle for an easy way to shine up stainless steel surfaces. Check again! Even when the rice cooker seems thoroughly clean, give it a once over before putting it away. Rice granules are tricky! And rice cookers can produce a considerable amount of moisture,which can too easily lead to formation of mold or mildew in the components of the device. Yech! A good quality rice cooker will give you years of perfectly prepared rice with just a little care and attention to it capabilities.